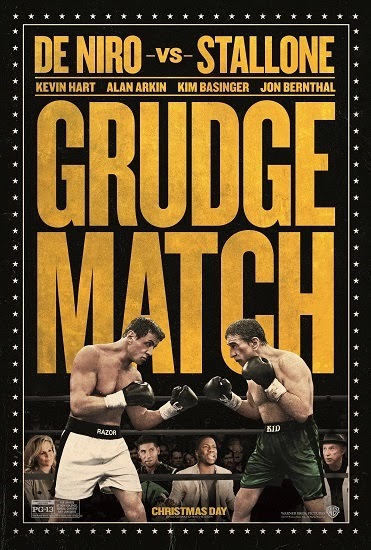 Win Passes to See Grudge Match before it hits theaters Christmas Day! Tinsel & Tine has 25 (admit two) Gofobo codes for the Grudge Match Preview Screening at The Prince Theater 7:30pm on Tuesday, December 3, 2013. Use the Rafflecopter widget below and Enter to Win! Note: Arrive Early! Screening passes do NOT guarantee seating. First Come First Seated. SYNOPSIS:Warner Bros. Pictures’ “Grudge Match” stars award-winning movie legends Oscar® winner Robert De Niro (“Raging Bull,” “Silver Linings Playbook”) and Oscar® nominee Sylvester Stallone (the “Rocky” films, “The Expendables”) as old boxing rivals who come out of retirement for one final match. Peter Segal (“Get Smart”) directs the comedy. Stallone and De Niro play Henry “Razor” Sharp and Billy “The Kid” McDonnen, two local Pittsburgh fighters whose fierce rivalry put them in the national spotlight. Each had scored a victory against the other during their heyday, but in 1983, on the eve of their decisive third match, Razor suddenly announced his retirement, refusing to explain why but effectively delivering a knock-out punch to both their careers. Thirty years later, boxing promoter Dante Slate Jr., seeing big dollar signs, makes them an offer they can’t refuse: to re-enter the ring and settle the score once and for all. Labels: Allie-THA, boxing, free screening passes, Gerber Pictures, gofobo, holiday movies, movie promotion, Rafflecopter Giveaways, rematch, senior citizens, Warner Bros.